In my last article about skill acquisition, I made the statement that improvements, in the cognitive stage of skill acquisition, are mainly due to thinking and planning as well as the ability of the athlete to uses existing knowledge/skills as a basis for the new skill. I gave the example of a lifter that I coach. I mentioned that most of the technical errors in her lifts came from previously learned skills that she was trying to consciously – or not- repeat in Weightlifting. I received many e-mails about this statement which lead me to believe that perhaps I should extrapolate on this concept. I will discuss the definition of what transfer of learning really is, its importance for coaches as well as its many possible applications. But first let’s start with a quote from one of the e-mails I received on this topic. Transfer of learning is a theory that stipulates that prior experience or previously learned skills will transfer – positively or negatively- to new skills or situations. In other words, whatever it is that you were doing before or experienced in the past, it is going to influence the learning of new skills as well as their performance. As previously said, the transfer could be positive (help the performance of the new skill) or negative (not help the performance of the new skill). Positive transfer of learning happens when there is a similarity between both skills (previously learned skill vs new skill) or when there is a similarity in both cognitive process/thought process. The person is then able to use what she learned in the past and use it in the current situation. For instance, a hockey player will find the learning curve to be minimal if he gets in speed skating. He already knows how to ice skate, has the balance to be on ice, etc. These elements are present in the ”new” situation, which is speed skating, and thus, he will start with a good base (doesn’t mean he will be great right off the bat or be as good as a real speed skater, but the skill will be easier to learn). Negative transfer of learning happens when the characteristics of the movements are not similar, although the situations could be similar in both cases. It other cases, it is the situations that differs. It can also happens because of mental confusion which is definitely present when learning a new skill. I will give two examples of this : 1) Although a marathoner knows how to run, the way he has trained has created very sport-specific adaptions that may explain why they could not beat a sprinter even if they tried to run at a faster pace 2) Although a crossfiter can do 30 snatches for what is considered respectable time in Crossfit, the adaptations from such training are not conductible to a place on the podium in weightlifting at the international level nor conductible to the physiological and neural adaptations as well as the technical refinements in order to do so. The importance of this concept is very important in the coaching of weightlifting and in the development of weightlifters. Among other things, this theory gives insights on possible ways to program for a beginner, how to coach kids, how to program different activities for rest days, and how to program for betterment of technique. If prior experiences have a very significant impact on the skill that the person is trying to learn and develop (weightlifting), it becomes apparent that the coach should be aware of the athletic past of his athletes as well as the physical and neural adaptations that derives from their previous sport. This is what I was saying about my salsa dancer lifter. The way they move in Salsa taught her to initiate most movements with the hip (or have the hip move around fast). Upon learning a new skill, she unconsciously drew back to previously learned skills and motor program. It is easier for the CNS (central nervous system) to use a learned motor program and adapt it to the situation as everything is somewhat wired already (more complicated then that, but it gives you the idea). This is important because it can explains some of the technical errors you see at the beginning of their lifting career. It also explain why you can have a lifter like Xiaojun (CHN) join the national weightlifting team around 18 years old with a solid background of sprinting only to become a top level lifter a few years later. He could transfer his skills in weightlifting in order to make himself better. This is the case of many other good weightlifters. 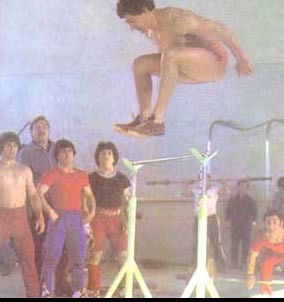 Yurik Vardanian, when he wasn’t busy making his way to the second highest sinclair total of all time, could jump above squat racks. Because prior experiences are important for future learned skills, it is obvious that kids should be exposed to a high number of different skills. As an example, Dr Zatiorsky, a great biomechanician, talked about how this principle is applied in gymnastic in an interview a few years ago. Young kids are exposed to a very large number of skills until they reach puberty in order to allow them to have a high capacity of adapting to new situations. Once they reach puberty, they will concentrate on a few very specific skills. This is why it is probably important to include gymnastics, jumps and sprinting drills in the training of very young lifters. It develops skills – like coordination, power of the lower limbs, balance, proprioception, etc. – that can impart positive transfer of learning later on. Weightlifting is no different. if your goal is to be the best weightlifter you can be, then most things you do outside of weightlifting has to produce positive transfer of learning and anything that produce negative transfer has to be eliminated or limited. The skill you develop in your activity has to positively influence the skills trained in your own sport. This is why professional Chinese weightlifters will play basketball (among other things) once a week on a rest day. Basketball involves a lot of power from the lower body and hip among other things. You will see this in many sports and in many nations. More importantly than anything else for the weightlifter is that the learning he is currently doing in his training has to positively transfer to better technique in the future. This place us in a position where everything you do in the gym has to transfer to better technique and this is where proper knowledge is important. You will often see lifters with a very high squat, for instance, fail to stand up with a clean. That means that part of this strength is not transferred in the lift. Everything you do now has to be transferable and this is the point that should be taken from this article. It says that he was recruited by a local weightlifting coach at a district track and field event in 1997 where he ran 200m and 400m dash – so he started when he was 13. His parents paid for him to train at the weightlifting school, but ran out of money because his dad got in an accident and had to pay compensation to the victim. He qualified for the provincial weightlifting team when he was 15, which meant he no longer had to pay tuition fees and was able to continue to train. He then placed 3rd at nationals when he was 19 and then began training with the national team. They make no mention of him ever training in track and field after starting weightlifting. Thanks for pointing out my typos, It should have read : Xiaojun joined the national teams around 18 years old although he had a decent sprinting formation. It is edited. Anyhow, that part is anecdotal to the rest of the article. Good point. Of course it applies to pretty much everything. In motor behavior it’s a bit different because it will often be unconscious though. 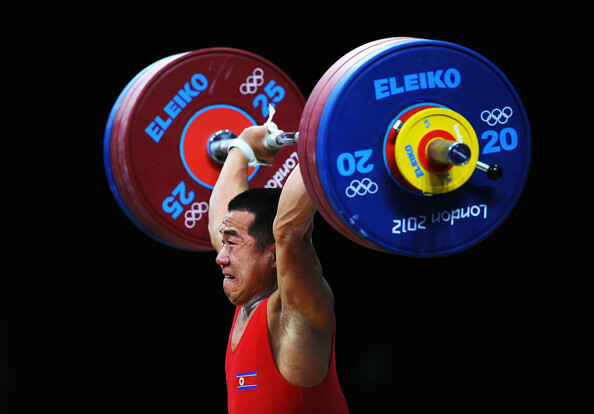 What sport were you competing in before switching to weightlifting.